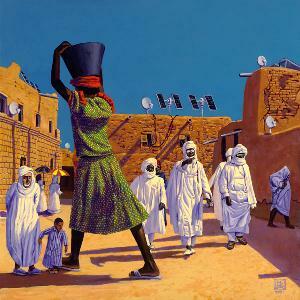 Mars Volta is responsible for one of the most original sonorities of the first decade of the XXI century. In 2001, their first album brought a surprising blend of progressive and psychedelic rock with punk and Latin vibes, in their second (and probably their best) they continued further their progressive rock roots and eclectic musicianship with a more matured work. Although their third was considered by many a step back, The Bedlam in Goliath brought back the band's creative vein, once more progressive and experimental. Cedric's voice is increasingly peculiar and high-pitched (and again with many exquisite experimentations), which can annoy many listeners. And so we can say about their attitude towards music and composition, increasingly more disconnected about every opinion and consideration not their own, particularly the fans (which I won't say it could not result in the most positive things). This is emphasized on the opener Aberinkula, even so one of the least surprising tracks of the album, starting the album pounding with Cedric's screaming refrain and Prigden's proficient drums without warnings, introductions or preparations. Their vision concerning music or, should I say, art, traduces in non-conventional traces like this - they couldn't care less. Tracks are usually developed in two parts, in very dynamic and energetic approach, almost without space for more substantiated calmer moments. Even so, when they exist, they are genuinely felt. Metatron portrays very well these characteristics, without a doubt one of the most shining standouts of the album. The orchestration of the instruments is so complex that we could barely imagine such a combination with succeed in a relatively understandable music track - sometimes we have three (!) different guitar solos competing at the same time, not to mention all the rest (which include saxophone, flute and clarinete). Unsurprisingly, the album is a technical standout: new drummer Thomas Prigden's fast-tempo drumming is a standout by itself, sometimes making us doubt if a Human Being is capable of such beat; while the several guitars are combined in every way and tone, from complex and heavy to punctuated riff to mesmerizing solos and effects. Ilyena and Wax Simulacra are the possible singles of the work, the first one being particularly effective while conserving the distinctive ingredients. Goliath combines a Rage Against the Machine riff to an explosive jam end, a la hard-core. In fact, this record is the most heavy of their catalogue, with Ouboros starting with a heavy punctuated guitar riff which would certainly not dismiss any death metal track, after a brief introduction a la Prefab Sprout. Cavalettas shows some interesting guitar experimentations and Askepios is the most pompous and spacey of all tracks, remembering the majestic rock of King Crimson and Tool's intriguing darkness. This track starts a magnificent trio with Ouroboros and Soothsayer, this last the corollary of their complex orchestrations, fusing a Latin background motif to space sound effects, violin arrangements a la classical music, psychedelic and more-conventional guitar jams, in a terrific and more again a surprising blend of unthinkable combinations. The album may require several careful listens to be understandable, and to notice the many intricate variations which exist, due to its high complexity. Mars Volta may loose much from the somewhat egocentric attitude of its members, and certainly they may one day deserve to be pointed the finger (if really that day comes), but this certainly is not the time - this is respectfully a work of geniuses.